Disability Advocacy Sunday (DAS) is observed on a Sunday before Advent Sunday every year since 2011.
is both celebration and challenge. 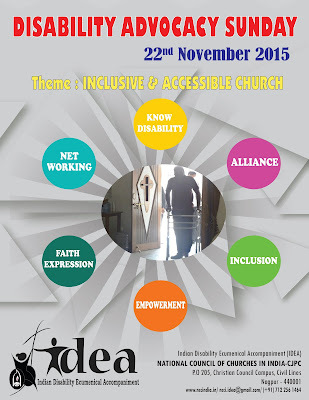 is to celebrate lives and witness of the Persons with Disability (PWDs) amongst us. aims to facilitate the Churches to open their doors to become inclusive, accessible and hospitable to the PWDs to fully participate in the very Life, Mission and Ministers of the Churches. is an opportunity to raise awareness and to find solutions to the physical, architectural, communication and attitude to those with PWDs. is paves ways to the PWDs to participate and lead the worship and liturgies and read scriptures and even ministering the Words of God. is giving a chance for the Churches to review their mission agenda to address the Disability issue differently, creatively and relevantly. 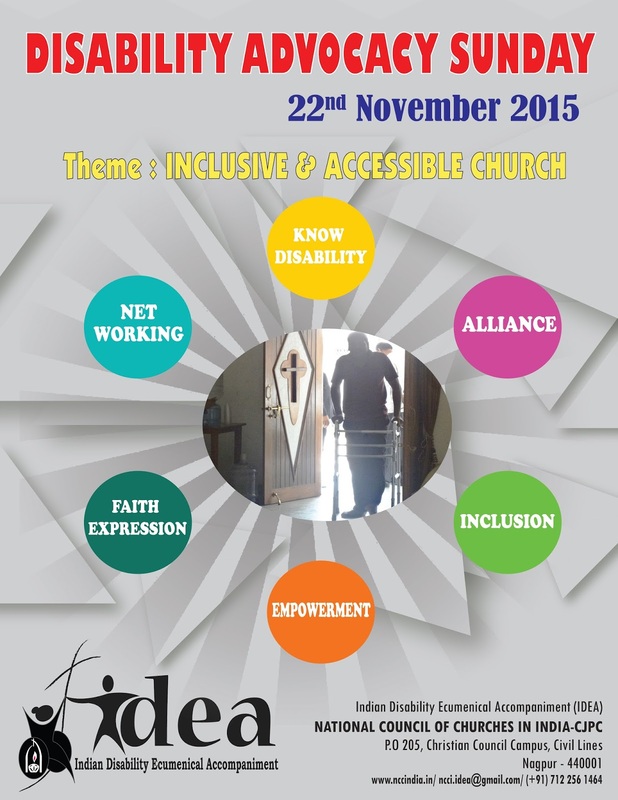 November 6, 2014 is a bench mark year in the faith journey of the NCCI - Indian Ecumenical Disability Accompaniment (IDEA). No society and Church could declare that, there are no PWDs in us and among us! If any Church is found without a PWD, the DAS is a good time to examine why that is the Church open and actively seeking to make itself to open to all?